Whoa! The weather forecast was accurate! It’s blasting hot today and while it was kind of breezy in the morning, temperature was already at 83 degrees which climbed up to the 90's towards noon and until the aftenoon. But I already have our lunch planned for our guests who arrived last night. Pasta in the meal is very much appreciated but at some point, I always try to prepare something close to home. I know they miss home cooked meals so much so I surprised them with Hainanese Chicken Rice. It’s a little deviation from the steamed organic chicken I normally prepare for them with bokchoy and soy-ginger and sesame dipping sauce. 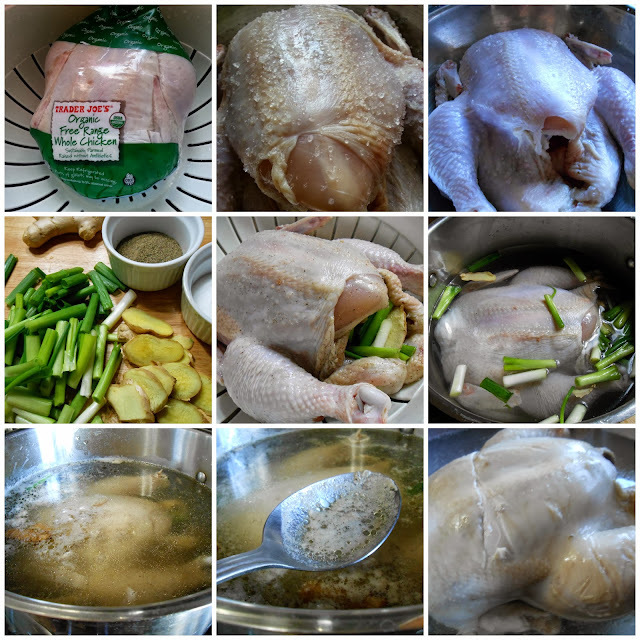 Hainanese chicken is done by poaching the chicken with aromatics on low just until cooked through then submerged in ice bath to stop the cooking. Then sesame oil is rubbed into the chicken to give it that shiny and golden finish. It is then served with rice and dipping sauce. It’s really all about the chicken so it has to be fresh free-range or organic chicken for best results. 1. To clean the chicken, with a small handful of kosher salt, rub the chicken all over, getting rid of any loose skin and dirt. Rinse chicken well, inside and outside. Season generously with salt and freshly cracked black pepper inside and outside. Stuff the chicken with the ginger slices and the green onion. Place the chicken in a large stockpot and fill with cold water to cover by 1 inch. Bring the pot to a boil over high heat, then immediately turn the heat to low to keep a simmer. Cook for about 30 minutes more (less if you're using a smaller chicken). Check for doneness by sticking a chopstick into the flesh under the leg and see if the juices run clear or insert a thermometer into the thickest part of the thigh not touching bone. It should read 170F. 2. When the chicken is cooked through, turn off the heat and remove the pot from the burner. Immediately lift and transfer the chicken into a bath of ice water to cool and discard the ginger and green onion. Don't forget to reserve the poaching broth for your rice, your sauce, and the accompanying soup. The quick cooling will stop the cooking process, keeping the meat soft and tender, and giving the skin a lovely firm texture. 5. To make the chili sauce: Blend your chili sauce ingredients in a blender until smooth and bright red. 6. To make the soup: You should have six or seven cups of the reserved poaching broth left over to serve as soup. Just before serving, heat up the soup, taste and season with salt as necessary. Serve the chicken rice with chili sauce, dark soy sauce, cucumber slices, and a bowl of hot broth garnished with cilantro or scallions. This will do on a cold weather but today, I skipped the soup because it was so hot we were literally hugging tall glasses of watermelon-coconut slushies. Oh and I just realized I forgot to take pictures of our drinks. I'm not so much into carving meat but with the aid of my kitchen shears, I was able to cut the chicken into nice pieces without deforming it. The guests were happy and so am I. This is one dish I'll never get tired making. Suddenly, I'm reminded of Ms K and how she would get free-range chicken for me from their neighborhood source which is always guaranteed fresh. But she's having fun back home savoring all the foodie delights- something like this dish included! Wow that looks amazing! I've never had Hainanese chicken rice before but knowing that the chicken has been flavored with ginger and green onion makes it irresistible. I can't wait to try out your recipe! Thanks! Just make sure to use organic free-range chicken for best results. Like I said, it's alll about the chicken flavor. The ginger and green onion just add more to it. Please let me know how it turns out. Happy cooking!